Duncan Aviation's Avionics Satellite are located within 200nm of 90 percent of the 50 busiest general aviation airports in the United States. In addition to your everyday and AOG avionics needs, they lead the industry for avionics installations to meet upcoming NextGen Mandates. Duncan Aviation's Avionics Satellites are strategically based at more than 25 business airports across the United States. Each location is interdependent, sharing staff and resources to support customers anywhere they land, live or hangar their aricraft. 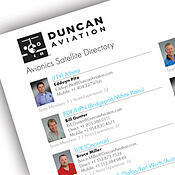 Click on photo to the right to download your copy of the Duncan Aviation Satellite Directory.